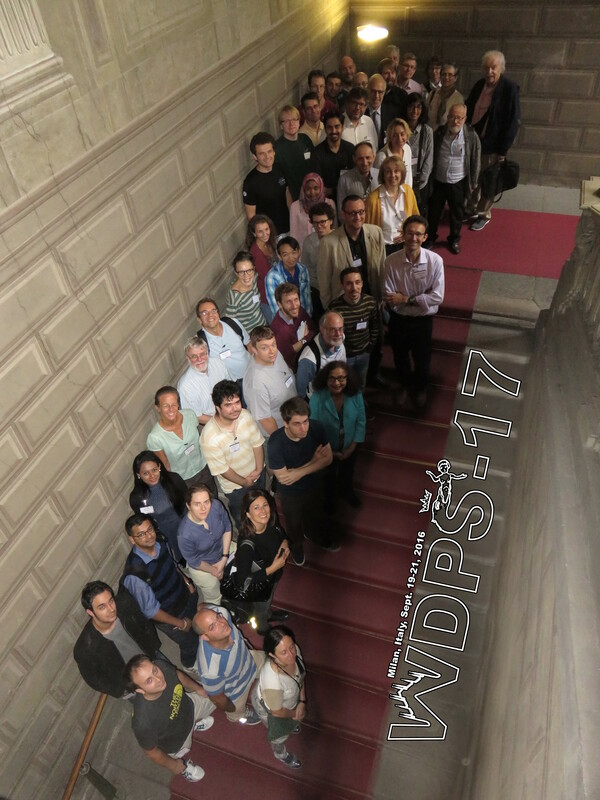 WDPS-17 has been a 3-day workshop, with oral and poster presentations. Namely, we had 8 invited talks (40′) and 16 contributed ones (25′), all followed by at least 5′ discussions, and two poster sessions. 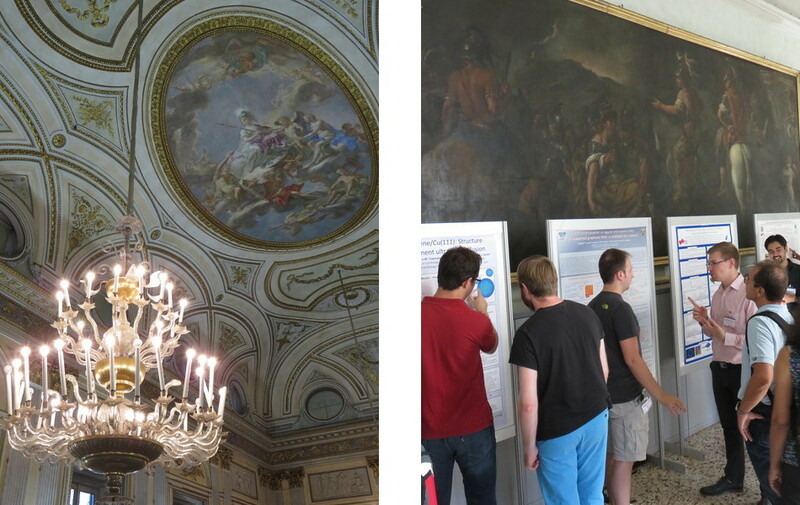 The event was hosted by the University of Milan in an eighteenth century palace. The list of participants included more than 50 surface physicists and chemists, with a similar number from the theoretical and experimental community. The largest participation was naturally from Italy (22) followed by Germany (7), the US and the United Kingdom (4 each), Austria, France, and Spain (3), Croatia and The Netherlands (2), Israel, Sweden, and Switzerland (1). Participation by young researchers and Ph.D. students was fostered through the support of travel and accommodation expenses. Diffusion at surfaces is one of the central topics in the WPDS, and was opening this edition with the invited talk by Alexander Shluger, titled “Understanding the adsorption and self-assembly of functional organic molecules on insulating substrates”. He reported on the results of a multiscale approach, from MP2 to DFT, force fields molecular dynamics and kinetic Monte Carlo, for the formation of self assembled molecular layers on ionic surfaces. The role of entropy loss for stabilized molecule was particularly investigated. Also, the effects of the adsorbates on the substrate were presented. The talk was the stimulus of a quarter-of-an-hour long discussion, as also happened after several other talks at WDPS-17. The focus for the talk by Karina Morgenstern, “Correlated diffusion investigated by low-temperature scanning tunnelling microscopy”, was instead the experimental study of CO diffusion highlighting the role of neighbouring molecules on the diffusing one – also in presence of long range molecular interactions mediated by surface states, showing the need of modelling beyond two-body models. Laser induced diffusion could exhibit opposite phase in the dependence of the diffusion barrier with CO-CO distance. Anton Tamtögl presented his results based on He atom scattering (a long-standing interest in this series of workshop) in the He3-spin echo flavour: “Diffusion on a topological insulator surface: H2O on Bi2Te3(111)”. That was the first application of such a high-resolution technique to a topological insulator. The signature of repulsive water-water interaction, seemingly counter-intuitive at variance with hydrogen bonding, is motivated by the dipole moment the adlayer carries. After these three talks all attendees could diffuse towards the coffee break, to refresh before a session focusing on friction. Astrid de Wijn is a young scientist with a long participation in the series and was keen to accept the invitation to present her work titled “Nanoscopic friction under electrochemical control”. A useful introduction to friction and its modelling was followed by the study of how friction of a pulled object, like an AFM tip, is influenced by adsorbed dipolar layers and electric fields. A simple model rationalizes the rich dynamics occurring in the experiments, with the example of sliding friction above pyridine adsorbed on Au(111) where describing the anchoring of the molecule by a specific termination proves essential. In the talk by Nicola Manini, “Frictional features in graphene nanoribbons deposited on gold”, the focus was on static friction as a function of the lattice mismatch between a sliding object and a surface. With the support of slides showing examples from our everyday life such as combing and taking the dog for a walk, he has presented how theoretical modelling can be related recent experiments for GNR/Au(111) showing the presence of directional locking (or leeway) occurring at various orientations of the ribbon axis on the surface. Next in the session, Maria Clelia Righi moved from model potentials to first-principles: “Ab initio investigation of tribochemistry mechanisms in solid and boundary lubrication”. In collaboration with a major automotive manufacturer, her research was based on Car-Parrinello simulations for water and graphene in between carbon and iron surfaces, respectively, compressed and sliding one over the other. The fields of heterogeneous catalysis and friction come into close contact. Lunch was followed by three talks on interfacial electron transfer. Latha Venkataraman, in her “Physics and Chemistry of Single-Molecule Circuits” invited presentation, presented us fascinating results produced by her “easy-to-build”, 1 cubic foot experimental STM molecular break junction apparatus. Electrolyte gating was central in her presentation, showing its potential for molecular diodes with high rectification ratios and for controlling the charge state of quantum dots and Coulomb blockade effects. “Collective electrostatics determining photoexcitations and charge transport in self-assembled monolayers” was then the title of the talk by Egbert Zojer, a subject that “has been hunting him since more than a decade”. From single molecules to self-assembled monolayers, the audience was presented evidence of the differences in electrostatics, the resulting shift of the energy levels, and the effect on conductance. X-ray photoemission could be used to demonstrate and investigate such phenomena. Abhilash Ravikumar, Ph.D. student, has then presented his theoretical contribution “Femtomagnetism in graphene induced by core level excitation of organic adsorbates and the role of electron transfer”. The interplay between electron transfer phenomena, core-level excitations, and magnetism in functionalized unsupported graphene was presented, before discussing the influence of a metal substrate underneath. The workshop included two poster sessions (see the workshop site for the list of posters). 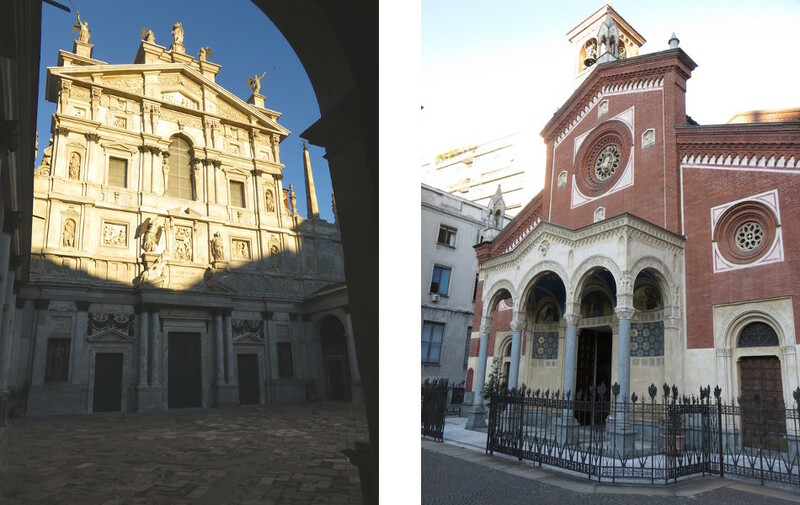 After the first one, an extemporized guided city walk among historical churches of a sunny Milan brought the participants to a pub for an informal get-together. Stephan Rauschenbach started the second day by an invited talk on interfacial growth: “Electrospray Ion Beam Deposition of Proteins, Peptides, and Sugars: Macromolecular Structure Revealed by STM”. The technique complements with thermal deposition and allows a low contamination ratio and control of the charge of deposited species, as shown by various examples. Back to diffusion, Theodore L. Einstein‘s talk, “Transient Mobility Revisited: Impact on Signatures of Island Growth on Surfaces”, presented a Voronoi cell based study of diffusion and adhesion limited aggregation regimes and a quantitative model to account for hot precursors in nucleation. The application to societal areas like chief town distributions in France, Italy, and Germany, was presented. Luca Vattuone, in his “Observation of the acoustic surface plasmon by inelastic neon scattering” talk, discussed the advantages of hyperthermal Ne scattering over HREELS for low-energy detection of surface plasmons. The width of measured features was correlated to long propagation length in potential devices. After a short break, “Surface chemistry for organic-inorganic interfaces – a quantum chemical perspective” was the title of the invited talk by Ralf Tonner. After the description of energy decomposition analysis for finite and periodic systems, the analysis of kinetics and entropy was shown again to be crucial in trapping adsorbed species on Si(001). The invisibility of precursors species in STM experiments was related to their electronic properties rather than their formerly supposed high mobility. Emilio Scalise presented next a talk “Probing the interface between semiconducting nanocrystals and molecular metal chalcogenide surface ligands: insights from first principles”, where a non-trivial dynamics of the interface between the nanoparticle and its ligands was determined by ab initio simulations and thermodynamics. Partially filled surface states were also shown to occur as S atoms migrated to subsurface sites. Ivor Lončarić, Ph.D. student, presented recent developments on a traditional WDPS topic, atom-surface scattering and adsorption. In his “Dynamics of CO interaction with Ru(0001): microscopical elucidation of the results of molecular beam experiments”, by the calculation of a multidimensional potential energy surface from DFT and its application in a Langevin equation, he has evaluated the sticking and the scattering angle distribution for impinging CO molecules. The afternoon devoted to spectroscopy was opened by the invited talk by Alessandro Coati, “Organic molecules/Metallic surfaces structures studied by x-ray scattering”. He introduced the audience to GIXD, GISAXS, and XRR techniques with examples for pentacene on Cu and C60/Co. In the latter, C60 was found to pull out Co atoms inducing a surface reconstruction. The need to interoperate with modelling in order to resolve complex structures raised significant interest in the theoreticians. The forthcoming talk, “Porphyrin Self-Metalation on Rutile TIO2(110)” by Luca Floreano, was also strongly based on X-ray experiments. Molecules were determined to capture surface hydrogen on titania already at room temperature, and to metalate via incorporation of Ti atoms at higher temperatures, independently of molecular terminations. Simulated optical spectroscopy was instead the technique by Elena Molteni in her “Uracil-like nucleobases on Si(001): effect of molecule adsorption, geometry and chemical substitutions on the electronic and optical properties of the silicon surface”. The influence of the adsorbed molecules on the RAS spectrum was found to be due, in the visible and near-IR range, to substrate modifications. A second poster session was the last scientific reward of the day before meeting for the social dinner. The last day was opened by George Malliaras, whose invited talk was titled “Interfacing with the Brain using Organic Electronics”. The detection of single-neuron activity by conformable electrodes, without penetrating the brain, was one of the examples shown. Upon the question of what challenges for surface scientists are most relevant here, the need to characterize the surfaces and the water/polymer interfaces by in-liquid techniques was pointed out. Next, Ph.D. student Virginia Carnevali presented her work on “Graphene Moire’ structures on Ni(001): atomic-scale investigation”. The hexagonal/square mismatch opens the possibility of different configurations thanks to the rotational degree of freedom, as shown by STM and investigated here by ab initio. Alberto Calloni‘s talk “Structure and electronic properties of Zn-tetra-phenyl-porphyrins single- and multi-layers films grown on Fe(001)-p(1×1)O” complements the one by Floreano on such interesting molecules. Here an atom-thick oxide layer is taken as a general strategy for ordered organic monolayers, weakly interacting with the substrate, with UPS and XPS showing O segregation on top of multilayers and interfacial charge transfer. Eva Rauls‘ invited presentation, “The Interesting Properties of Functionalized Macromolecules on Metal Surfaces”, moved from porphyrines to metal corroles, which aggregate in non trivial interwoven monolayer structures on metals as identified by DFT simulations coupled to X-ray experiments. Ring closure reactions occur, showing that the evolution of the monolayer with temperature is characterized by intermolecular but also intramolecular transformations. “Molecular Beam Spin Echo – Probing Molecule-Surface Interaction with a Molecular Interferometer” was the title of the talk by Gil Alexandrowicz. His apparatus has at its heart a hexapole magnet specifically designed so as to focus, for example, a beam of orthowater on the sample. The theoretical description of the features observed in the scattered beam is currently an open challenge. We look forward to updates at the forthcoming WDPS-18. Last but not least, Duy Le, in his talk “Metal-dipyridyltetrazine chains with single metal coordination site: insights from first principles calculations”, reported on highly stable metal-organic coordination networks immobilizing single Pt atoms up to 150°C. Their catalytic properties have then been investigated, with Pt having the same oxidation state as in PtO. Final remarks included anticipations about WDPS to possibly return to the US (Orlando) for its 18th edition after several ones in the EU. Stay tuned!